When living on the big compound I made many experimental desserts. I have always loved old recipes and find them to be so elegant. I had already made cream puffs and so Eclairs didn’t seem like much of a stretch. I made them several times and they became a big favorite. 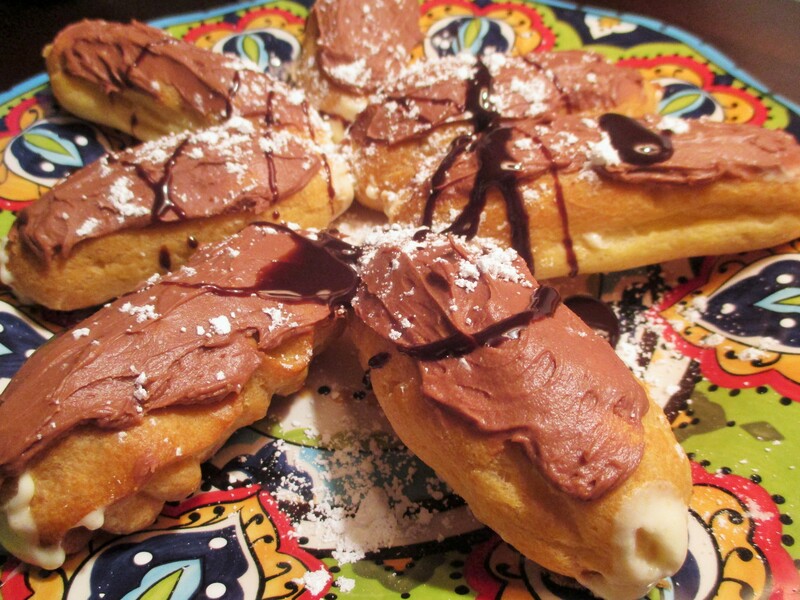 You can fill these eclairs with any type of custard and frost them with chocolate glaze or frosting of your choice. I use my chocolate frosting- found in recipes. Place water and butter in a sauce pan over medium heat. Let this simmer until butter is melted and mixture starts to lightly boil. Remove from heat and add flour, whisk well. Crack eggs into a separate bowl. Add one egg and gently mix, do not mix too quickly or this mixture will turn into a soupy mess! Add each egg, gently stirring after each addition, until you see the batter nice and thick, beat with a spoon to mix eggs in completely. I usually just scoop up some batter with a spoon and make it into a long shape on the baking sheet, but this time we used a decorating tool to pipe out dough. So either way is fine. Place dough onto the baking sheet and place in preheated oven. We made smaller eclairs and this made about 15. Place baking tray in oven on upper rack. Time pastries for 15 minutes, turn heat down to 350 degrees and continue baking for an additional 15 minutes. Eclair shells should be dark brown and hard. We baked them for 30 minutes total and our shells were fairly small. Oven temperatures vary and baking time depends on the size of the shells, so they way I tell if they are done, is that they should be dark brown and hard. Remove tray from oven and let shells cool. I usually cut the eclairs and scoop out the doughy inside, discarding it. This time we chose to use a decorating tool and piped custard into them gently from each end. Frost with chocolate and refrigerate.